The Old Testament timeline begins in the book of Genesis with the Creation story. Plainly put nobody knows when this was. Like most other issues associated with the Old Testament, the history of the Old Testament is a hotly debated topic. It is difficult, thus, when presenting an Old Testament timeline to capture all of the different theories and dates provided for certain periods and people. Just about every incident, character, king, etc. in the Old Testament has multiple dates given for when it occurred. However, most of these dates differ by no more than a few years to a decade. Click on the link below to view that Old Testament Timeline. LEAVE YOUR COMMENTS & OPINIONS! The time stretching from Abraham to Nehemiah pretty much covers the entire Old Testament. Roughly speaking, the time in question is 2000 BC - 400 BC, though most all OT dates are debated topics. One incident, however, in particular stands out with vastly different dates and different theories as to how that day was calculated. The Exodus of the Israelites under Moses is, arguably, the most debated topic on the Old Testament timeline. As will be seen, two primary camps exist within this debate. One claims a High Date of ca. 1446 BC. The second camp clings to a Low Date, ca. 1250 BC, or more broadly in the thirteenth century (1200's BC). Thus the Old Testament timeline one studies and reads about is primarily defined by when that particular author believes the Exodus to have occurred, among other factors. Compelling evidence exists for both arguments to be made, though the Biblical text itself (though vague in some instances) primarily points to a date of around (ca.) 1446 BC. Another question mark on the Old Testament timeline is the time period of the Patriarchs; Abraham, Isaac and Jacob. Some critics, like Hershel Shanks, even deny the Patriarchal narratives were actual history. Shanks claims in his book, Ancient Israel, "The Patriarchal history represents Israel's self-understanding about 1000 BC". In other words, the history was created to explain how Israel had arrived at its current state around the time of Kings Saul and David, ca. 1050-971 BC. The monarchy was a significant shift on the Old Testament timeline from tribal existence to existence as one nation. This theory, however, is far from certain and possesses many opponents. True there is no archaeological evidence to suggest Abraham existed. Scholars across the spectrum, though, agree this is no reason alone to deny his existence. The Epic of Gilgamesh (copies date from ca. 2100 BC) speaks of a catastrophic flood in stunningly similar terms as Noah. Though no date is known for this catastrophe, scholars agree it is very likely to have occurred in the most remote past. The same, in many cases, holds true for Abraham, Isaac and Jacob. A High Date of 1446 BC for the Exodus out of Egypt allows plenty of time for the Judges. Prior to that, the Hyksos period has been suggested as a likely time for Joseph's rise to power in Egypt. Biblical Archaeologist William Albright pointed out how the movements and social customs of the Old Testament patriarchs, beginning with Abraham, agreed widely with many of the known social customs and migrations (particularly Amorite migrations) of the late 3rd millennium, early second millennium BC, or ca. 2100 - 1900 BC. Both Albright and Holman's Bible Atlas agree Abraham was likely to have lived around the time of these migrations; namely the Amorite migrations into Mesopotamia from the Syro Arabian Desert in the west. Scripture seems to indicate that many of the Biblical families may have been of Amorite stock. Indeed the first possible character on the Old Testament timeline that may be dated with any degree of certainty is Abraham, though his dates are speculative as well. However, two dates are known with certainty on every Old Testament timeline. Those dates are the destruction of the northern kingdom of Israel by the Assyrian king Shalmaneser V in 722 BC (and Sargon II after), and the destruction of Jerusalem and the Temple of Solomon by the Babylonians under king Nebuchadnezzar in 587/6 BC. Even scholars disagree as to 587 BC or 586 BC as the precise year of Jerusalem's destruction. Regardless, these two dates remain as fixtures on the Old Testament timeline. Very few other instances and people can claim such. BEFORE THE YEAR 2000 BC OUR KNOWLEDGE OF THE WORLD'S CIVILIZATIONS IS SCARCE. THE EARLIEST KNOWN CIVILIZATION ARE THE SUMERIANS, AND WE KNOW VERY LITTLE OF THEM. HOWEVER, THEIR FLOOD MYTH IS EERILY SIMILAR TO THE BIBLICAL FLOOD IN GENESIS. The Old Testament timeline before Abraham is one of uncertainty. The dates of the flood and the Tower of Babel are unknown and perhaps will never be known. However, Genesis 10:9-10 seems to offer a bit of insight into some relative dates on the Old Testament timeline prior to the time of Abraham. The dates may offer a general time frame for the Tower of Babel narrative and Nimrod, the chief architect of Babel. These events are some of the oldest on the Old Testament timeline. It is immediately after the flood we read of Nimrod and the Tower of Babel. That narrative, in turn, is followed by Abraham. "He was a mighty hunter before the Lord; therefore it is said, 'Like Nimrod a mighty hunter before the Lord.' And the beginning of his kingdom was Babel and Erech and Accad and Calneh, in the land of Shinar." It is the cities mentioned in this passage that may offer a glimpse into the antiquity of Genesis and place chapter ten within a relative period on the Old Testament timeline. All of these cities mentioned were Sumerian cities located in southern Mesopotamia, around modern day Baghdad, Kuwait and the Persian Gulf. The Biblical Erech is known as Uruk in Sumerian literature, and as Warka to the Arabs. Erech has produced some of the oldest buildings known to man, dating from ca. 3000 BC. Genesis 10, then, may be placed on an Old Testament timeline at some time in the third millennium BC prior to Abraham. Some scholars have associated Sargon with Nimrod. Sargon captured Erech from the Sumerian king Lugalzaggesi. He established the kingdom of Akkad ca. 2334 - 2279, dates vary. Erech, though, was much older than that. Clay tablets along with the buildings mentioned above indicate a flourishing city ca. 3000 BC. A life-sized female marble head was unearthed dating to 2800 BC. Gilgamesh himself was king of Erech ca. 2500 BC. Erech was dedicated to the heaven god An, at one point the Supreme god of the Sumerian pantheon. This was roughly the time of the Royal Tombs discovered in Ur, mentioned below. Interestingly enough, the Epic of Gilgamesh also speaks of a catastrophic world-wide flood, also found in Genesis. 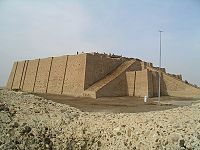 After the flood Erech was the second Dynasty to rise in Sumeria. The first was Kish, followed by the Dyansty of Erech, and lastly the Dynasty of Ur (discussed below). It is with the Third Dynasty of Ur, and its fall ca. 2004, that the Old Testament timeline may begin with God's call for Abram to leave Ur. Genesis 10:10 speaks of Nimrod building Erech. Though we cannot deduct from the evidence when that was, we do know it was prior to 3000 BC. A temple to An, along with other buildings, clay tablets, works of art, etc. have all been discovered in the city dating from ca. 3000 BC. Erech is also associated with the divine. A portal, in Sumerian literature, is said to have existed at Erech which would transport one to the netherworld. The Sumerian god Dumuzi was its ruler at one point. Dumuzi is the god Tammuz mentioned in Ezekiel 8:14. It is clear that the Sumerians are closely connected to this chapter in Genesis. Based on the textual evidence we may place this verse as speaking of a time prior to 3000 BC on the Old Testament timeline. THE DATES SURROUNDING THE PATRIARCHS - ABRAHAM, ISAAC & JACOB - REMAIN QUESTIONABLE & DEBATED TOPICS. IT IS GENERALLY AGREED ABRAHAM LIVED ca. 2000 BC. THIS IS THE DATE HE LEFT UR. THUS MANY OF THE OT EVENTS OCCURRED WITHIN THE BRONZE AGE. Middle Bronze Age (ca. 2200 - 1550 BC) documents mention the ancient city of Laish. Settlers have been discovered dating back to the Early Bronze Age (ca. 2900 - 2200 BC) in Laish. The Bible first mentions Laish during the time of Abraham in Genesis 14:14. A city gate was unearthed in Laish/Dan dating back to ca. 2000 BC. Laish would later become Dan, of the migrant tribe of Dan. Rehoboam would build a temple modeled on the one in Jerusalem in Dan after the kingdom split in two (ca. 922 BC). This city will continue to be important archaeologically throughout the Old Testament timeline. The Rose Book of Bible Charts, Maps & Timelines lists the Patriarchal Period as stretching from 2000 - 1500 BC. Biblically speaking this time period covers Genesis 15-31. Thus Abraham's call from "Ur of the Chaldees" signals the beginning of our attempt to date the Old Testament timeline. The phrase, "of the Chaldees", was a later addition, what Longman and Dillard called a "textual updating" made after the rise of the Babylonian Empire. Traditional scholars, such as Albright and Speiser, placed Abraham on the Old Testament timeline from ca. 2100 - 1900 BC. Some scholars place the birth of Abraham ca. 2166 BC. Others place it much lower, ca. 1952 BC. Thus, it is generally safe to offer the time frame stretching from ca. 2200 - 1900 BC as the most probably date for Abraham's existence. It seems logical to start with the home city of Abraham, Ur of the Chaldees. The Sumerian city of Ur was an extremely ancient city. It dates back to the mid-third millennium (ca. 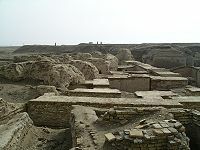 2500 BC), possessing Royal Tombs and a Ziggurat from this era. We know much of what life would have been like during Abraham's time from these finds. It was a city dedicated to the moon god Nanna, which the Bible states Abram's father Terah did worship other gods (Joshua 24:2). At the end of the third millennium BC Ur was in its Third Dynasty, the last important Sumerian dynasty. Ibbi-sin was the last of the Third Dynasty kings when Ur fell to the Amorites and Elamites in ca. 2004 BC. Interestingly enough, all of the kings of the Third Dynasty were Semites. Samuel Noah Kramer asserts the close connections that existed between the ancient Sumerians and the ancient Hebrews. One of his key pieces of evidence is the name Shem, which Kramer shows as being the Hebrew pronounciation of the Sumerian word for Sumer. Sumerian civilization dated back to the beginning of the third millennium, ca. 3000 BC, though it was likely much older. Thus the Old Testament timeline starting with Abraham necessarily would start at the earliest ca. 2200 - 1900 BC, the date most scholars offer. Many feel the Amorite invasion provides the backdrop against which Abraham left Ur. The Amorites swept into Mesopotamia from the western deserts and ruled ca. 2000 - 1800 BC. After the fall of Ur the Amorites took control of many cities throughout north and south Mesopotamia. Scholars and historians agree this was a time of relative instability in Mesopotamia, thanks in large part to the Amorites. In fact, as stated above both Albright and The Holman's Bible Atlas associated Abraham with the migrations of these Amorites. This is tempting, for it would provide a historical context and backdrop against God's call for Abraham to leave his hometown of Ur. Unfortunately any attempt to be more precise is simply speculation at best. One date stands out as perhaps offering a clue as to a more precise beginning for the Old Testament timeline. At this time the city of Ur was under kingship of its Third Dynasty. The ruler Ibbi-sin was the last ruler of the Third Dynasty of Ur, and in 2004 BC Ur fell to a wave of attackers from the east known as the Amorites. Archaeology has also confirmed the existence of Abraham's next residence, Haran, the hometown of Abraham's father Terah. Haran, like Ur, was a city dedicated to the moon god. The city exists today by the same name the Old Testament uses. Small villages nearby contain the names of Abraham's kin, Serug and Nahor. Scholars have little trouble associating these cities with Abraham's descendants and the Biblical narrative. They were in occupation as well during the Middle Bronze Age. Thus, the textual evidence of Abraham's movements in Mesopotamia does agree with what archaeology has proven was in existence from 2200 - 1900 BC. In Canaan, too, there was no central power. Virtually every major site in Canaan suffered major destruction between 2250 - 2000 BC. Egypt suffered around the same time, though still held sway around the beginning of the second millennium (2000 - 1000 BC). Ur had fallen ca. 2204 BC, thus the entire Near East had experienced an upheaval. The Hittites were a major force, yet their kingdom was later and stretched from ca. 1600 - 1200 BC. It would not be until ca. 900 BC that Assyria rose to prominence. Hammurapi rose to power in Babylon ca. 1750 BC and established the Law Code of Hammurabi. This Law Code bears remarkable resemblance to many of the Laws of Moses. Abraham was also recorded as having traveled extensively throughout Canaan and into Egypt. Shortly after his arrival in Canaan a famine drove him and his household to Egypt. This, too, has been shown to fit into the movements of the Middle Bronze Age. An ancient Egyptian tomb painting, known as the Beni Hasan Tomb Painting, was unearthed which depicted people from Palestine journeying into Egypt with merchandise for trade. This tomb painting dates from ca. 1900 BC, and confirms the Biblical description of people from Canaan crossing the Sinai into Egypt. It even portrays what the people looked like and wore from this time period, perhaps a portrait of what Abraham and his people would have looked like. Thus the Old Testament timeline may be placed generally as beginning with Abraham ca. 2200 - 1900 BC. The city of Ur, though, stretched much farther back into history. As does Erech, or Uruk, mentioned in Genesis 10:10 as being built by Nimrod. Sumerian civilization has shown to have already been developed around 3000 BC, and most probably before. These were an ancient people. Many scholars, such as Samuel Kramer, claim they were connected to the ancient Hebrews. There is little to no certainty as to any dates on an Old Testament timeline which may be mentioned in connection with Nimrod and the establishment of Erech. Chronologically speaking, in Genesis 11 Abraham follows the narrative of the Tower of Babel. Speculation exists and theories widely vary as to these events. The city of Erech, though, does date beyond ca. 2500 BC. It should be remembered that Genesis covers an immensley vast period of time even up to the Abraham narrative beginning in Genesis 11. Close to the Late Bronze Age (ca. 1570 BC - 1200 BC) many documents were unearthed which helped establish the social customs and norms for this period in Canaan's history. Much of the interpretation of these documents is agreed upon, however, certain scholars (like Shanks) deny they shed any light on social customs of the Patriarchal Period. It must be noted as well that the dates for the Early, Middle and Bronze Age also vary. These ages certainly overlapped, and the dates given can only provide a general view. Thus, for current purposes, the Old Testament timeline will start with Abraham, ca. 2200 - 1900 BC. The following dates are speculative and not to be taken as absolute fact. Scholars vary, yet not by many years in most instances. 1876 - 1446 BC = Sojourn and Enslavement of Israelites in Egypt. This supports a 15th century (1400's Bc) view of the Exodus. This supports a 13th century (1200's BC), or Low Date view of the Exodus. THE LATE BRONZE AGE WAS LIKELY THE TIME FRAME OF THE EXODUS. TWO PRIMARY DATES EXIST - 1446 BC & 1230 BC. THE CHRONOLOGY OF THE BIBLE SEEMS TO SUGGEST A DATE OF ca. 1446 BC. Scholars and archaeologists clamor for extra-biblical references in order to more accurately date the Old Testament timeline. Those references, however, have been few though valuable in helping determine the Old Testament timeline. One such reference provided scholars and historians with a solid date on the Old Testament timeline as to approximately when Israel became known as Israel to the people of the ancient Near East. The Egyptian Pharaoh Merneptah ruled Egypt ca. 1237/6-1223 BC. Merneptah brags of his campaigns into Canaan on a stele which dates to ca. 1230 BC. 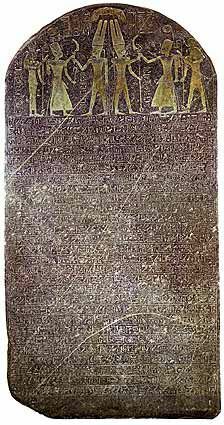 On this stele Merneptah speaks of waging war against and subduing "Israel". It is the first non-biblical mention of the word Israel as of yet discovered, and the first reference to the Israelites outside the Old Testament. Thus, by implication, at the time of Merneptah a group of people recognized as "Israel" existed in the hill country of Canaan. Thus we may place with certainty on the Old Testament timeline the date of ca. 1230 BC as knowing for sure that Israel was in the Promised Land. The fact they are referred to as a people called Israel would suggest, perhaps, they had been settled in the area for an undetermined amount of time, long enough to establish themselves and be recognized. The question arises, then, at what point on the Old Testament timeline did they leave Egypt and settle in Canaan. As discussed above two strands of thought dominate the argument; a 15th century BC Exodus and a 13th century BC Exodus. The Merneptah Stele provides a bottom line date for the Exodus, as it had to have occurred before the mention of Israel as dwelling in the hill country ca. 1230 BC. As Israel spent forty years wandering in the desert, then the Exodus would have had to occur before ca. 1270 in order for there to be a group called Israel in the hill country. This date allows for a 13th Century BC Exodus on the Old Testament timeline, yet allows for very little time for the actual conquest of the land and the period of the Judges. Scholars claim a period of 300 - 400 years elapses in the OT book of Judges. Zodhiates approximates a period of 350 years which are covered in Judges. Obviously this makes a 13th century BC Exodus unlikely, though the issue is far from resolved. By 1550 BC the 18th Dynasty of Egypt had risen to power. The Egyptian Pharaoh Ahmose rose to power expelling the Semitic Hyksos in 1570 BC (16th century). Many proponents of a ca. 1446 BC (15th century) Exodus claim Ahmose was the Pharaoh "who knew not Joseph". What cannot be deciphered, however, is the total amount of time the Israelites spent in slavery in Egypt. If Jacob descended with his family ca. 1870 BC, then they dwelt safely and prospered for quite some time. The Bible makes clear, however, they were eventually enslaved. The Bible gives clues as to when this may have occurred, or more specifically when the Exodus may have occurred. The Exodus, of course, was the result of Israel rising up against the slavery and oppression of Egypt. However, Scripture varies as to the exact length of time the Hebrews spent in Egypt. "And God said to Abram, 'Know for certain that your descendants will be strangers in a land that is not theirs, where they will be enslaved and oppressed four hundred years." "Then in the fourth generation they shall return here, for the iniquity of the Amorite is not yet complete." God prophecies to Abram what will happen to his descendants, while at the same time lending valuable insight as to when this will occur. The Amorites were one of seven nations of Canaan (Zodhiates, NASB Hebrew-Greek Key Study Bible). As stated above, they were responsible for the upheaval in Mesopotamia (Old Testament timeline ca. 2000 BC), and then established their kingdom ca. 1600 BC in Canaan and Syria. They were a profane, wicked and idolatrous people. They have been shown to have practiced human sacrifice, perhaps even infant sacrifice. They were fierce warriors and people of great stature and size. Ancient inscriptions depict them as tall as oak trees. As they conquered Mesopotamia around 2000 BC, they eventually moved back west into Canaan. By 1600 BC the Amorites were well established and the dominant force in Canaan and Syria. According to God's message to Abraham, His people would dwell in a strange land until the Amorites received their just and Godly punishment. That punishment must have occurred ca. 1200 BC, for that is the approximate time period of the Amorite collapse. The arrival of the Philistines ca. 1150 BC coincides with the Amorite decline in Canaan. The Philistines mark a specific time period as well on the Old Testament timeline. If 1200 BC is taken as the end of the Amorite influence, then their kingdom would have stretched ca. 1600 - 1200 BC, perhaps the four hundred years mentioned in Genesis 15. A weakened Canaan would have allowed Pharaoh Merneptah to campaign successfully in the region, as attested to by the Merneptah Stele. This should not be taken to mean that Israel was in Egypt from precisely 1600 - 1200 BC; but rather for at least stretches of this period. It would seem God kept His people away from the Amorites. He perhaps called Abram from Ur around the same time the Amorites conquered the city, ca. 2004 BC. Now, God keeps His people in Egypt (and perhaps wandering in the wilderness) during the period of Amorite dominance in Canaan and Syria, ca. 1600 - 1200 BC. However, critics have pointed at Genesis 15:13,16 as evidence the Old Testament timeline is unclear about the Exodus. They argue this passage contradicts what is said in Exodus 12:40-41. "Now the time that the sons of Israel lived in Egypt was four hundred and thirty years. And it came about at the end of the four hundred and thirty years, to the very day, that all the hosts of the Lord went out from the land of Egypt." The obvious discrepancy is how long they were in Egypt (400 years as opposed to 430 years). Biblical scholars have also argued about the length of a Biblical generation. Some have placed a generation at 40 years, others at 25 to 30 years. One's view of a generation also alters the Old Testament timeline significantly for the Exodus. Spiros Zodhiates, Th.D., has this to say about the two passages in Genesis and Exodus. "400 years is a round figure. There is no conflict with the 430 years mentioned in Ex. 12:40,41. The four generations of their sojourn should be understood as four lifetimes. One hundred years would have been a conservative estimate for one lifetime in the patriarchal times...The interval of their sojourn in Egypt would be given to the Amorites, who possessed Canaan at that time." Some critics claim the lifespans in the Old Testament is evidence enough to discount it. Other scholars will also point to the fact Josephus states in his Antiquities they were in Egypt only 215 years (Antiq. 14.2). An ancient Rabbinic source, Seder Olam 3.2, states the Israelites dwelt in Egypt for only 200 years. The clearest evidence of a date for the Exodus comes from I Kings 6:1. This is the chief argument for a fifteenth century BC date of Moses and the Exodus. "Now it came about in the four hundredth and eightieth year after the sons of Israel came out of the land of Egypt, in the fourth year of Solomon's reign over Israel, in the month of Ziv which is the second month, that he began to build the house of the Lord." Solomon ascended the throne just prior to his father David's death in 970 BC. On most Old Testament timelines Solomon's fourth regnal year would have been 966 BC. In 966 BC Solomon began to build the First Temple. This was a very significant time in Israel's history. The historian responsible for writing this verse relates to another significant event in Israel's history, the Exodus. He claims that it was 480 years ago when Israel left Egypt until Solomon began building the Temple. This verse places the Exodus on the Old Testament timeline at 1446 BC, a century after the Semitic Hyksos were driven from Egypt. This places Jacob and his family descending into Egypt ca.1876 - 1836 BC. If the Israelites wandered for forty years as the Bible describes then the Conquest would have began around 1400 BC. Take this date and pare it with the Merneptah Stele, ca. 1230 BC, and over a century and a half is given for the Israelites to settle into the land, by this time becoming well-known as Israelites, though still a loose confederation of tribes. Scholars agree the Conquest was not a lightning fast blitzkrieg of the land of Canaan. Rather, it spread out over the course of a number of years. Most scholars agree the book of Judges covers approximately 350 years. The book of Joshua makes it plain Israel never fully conquered the land. Scripture seems to confirm a Conquest ca. 1400 BC in Judges 11:26. In this passage the Judge Jephthah is arguing with the king of Moab. Moab has wrongly asserted that Israel took their land. Jephthah, however, correctly points out that his people have been in Canaan and the Transjordan for the past three hundred years and asks why the king just now seeks the land. "While Israel lived in Heshbon and its villages, and in Aroer and its villages, and in all the cities that are on the bank of the Arnon, three hundred years, why did you not recover them within that time?" THE PHILISTINE NAUE TYPE II SWORD. THIS WEAPON SLICED ITS WAY THROUGH THE IRON AGE. THE PHILISTINES POSSESSED TECHNOLOGICAL SUPERIORITY IN THEIR UTILIZATION OF IRON, AS THE BIBLE CORRECTLY INDICATES. Longman & Dillard point out in their book, An Introduction to the Old Testament, that "a close study of the chronological notices in the book of Judges" places Jephthah at ca. 1150 - 1100 BC. In the Biblical narrative Samson follows Jephthah. Samson's main enemies are the Philistines, shown by history to have arrived in Canaan ca. 1200 - 1100 BC. As stated above, the appearance of the Philistines marks a specific period on the Old Testament timeline. Jephthah asserts that Israel had lived in the land for three hundred years, placing their entrance into Canaan ca.1450 - 1400 BC. Also, his enemies are in Moab, not the Philistines. A Conquest of ca. 1400 BC fits nicely with an Exodus of 1446 BC. Thus the Late Bronze Age on the Old Testament timeline Biblically appears to have been the time of the Exodus, Conquest and period of the Judges. Anywhere from 350 to over 400 years is typically allotted for the Judges. Israel's monarchy began with Saul, who many scholars feel was anointed ca. 1050 BC. 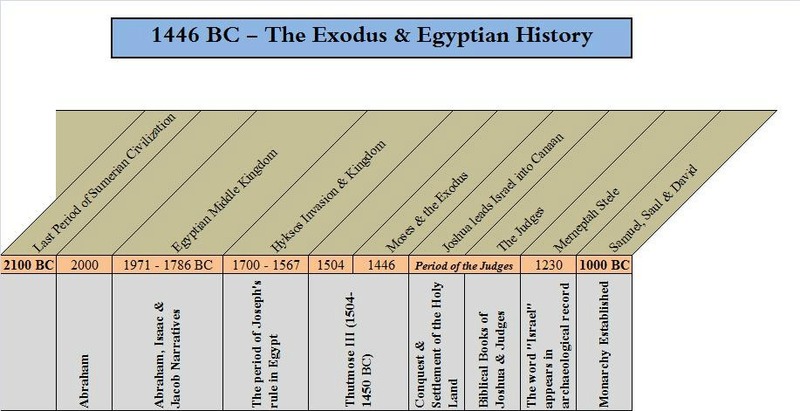 Thus the Biblical chronology of the Exodus in 1446 BC, Conquest ca. 1400 BC, Period of the Judges ca. 1400 - 1050 BC, fits with the Merneptah Stele identifying Israel ca. 1230 as already existing in Canaan. Skeptics are quick to point to other archaeological finds that lend credence to a 13th century BC Exodus. This significantly alters the Old Testament timeline by shrinking the window for the Conquest and Judges. The crux of this argument rests on two primary factors. One being the store cities of Pithom and Rameses Scripture depicts the Hebrew slaves as building in Exodus 1:11. Archaeology shows neither site was occupied in the 15th century. The cities have been identified by many with Tanis and el-Maskhouta, built by Ramses II ca. 1290 - 1222 BC. This would favor a 13th century Exodus. Another key piece of this argument are the sites in Canaan. Archaeology has show extensive destruction throughout all of Canaan dating from the 13 century BC, whereas the 15/14th centuries lack such evidence to support the Conquest of Joshua. This line of thought defines the Old Testament timeline on archaeological evidence. Critics offer counter-arguments, of course, against both archaeological findings. Some have looked at the site of Qantir as Pi-Ra'messe and Tell er-Retebah or Heliopolis as Pithom. Both sites would allow for a 15th century BC Exodus. J.J.
Bimson argued for the possibility of these two sites. Bimson also argued that the 13th century layer of destruction could just as easily belong to the period of the Judges. The 14th century BC Amarna Letters written to Akhenaten also depict Canaan in a state of unrest. On the Old Testament timeline this could either fit the Conquest or period of the Judges. Bimson states previously assigned 16th century (1500's) BC layers of destruction in Canaan, commonly thought to be the result of the Hyksos, could actually date to the 15th century (1400's) BC. This, of course, would allow for a Conquest sometime in the fifteenth century BC. Further notice of destruction (Amarna Letters; 13th cent. layers) were the result of both the Conquest and the unstable period of the Judges. Regardless, the Late Bronze Age is an important period of time on the Old Testament timeline. Textually speaking the inclination is towards a 15th century BC Exodus. Around 1200 BC civilization was introduced to Iron, thus initiating the Iron Age. It was during this time the Philistines arrived and became a major threat to Israel's existence. The Merneptah Stele proves a concrete date on the Old Testament timeline. Israel was already established in the hill country, as the Old Testament accurately depicts, in the 13th century. Thus the arrival of the Philistines would usher in a new danger for the ancient Hebrews. The Early Iron Age was a time of transition not only for civilization, but Israel as well. By 1100 BC Aramean kingdoms had risen in the north, at Zobah, Damascus, Hamath and Beth-rehob. Gaza, Ashdod, Ekron, Gath and Ashkelon made up the Philistine Pentapolis on the coast. From ca. 1200 - 900 BC no foreign power meddled in the Levant, leaving these city-state kingdoms to fight amongst each other. Israel found itself pushed into the hill country and threatened in multiple directions. The next section of the Old Testament timeline would see Israel's transition from tribal existence to a United Monarchy in an effort to fend off foreign threats. Share Your Thoughts, Opinions, Comments on the Old Testament Timeline! Do you have insight on this topic? Share it! Do you have questions? Ask them! Do you have comments? Leave them! Why were Egyptian Pharoah's Senusret III and Thutmose III so Evil? Why was Aten worship so important even in Amenhotep III's reign?